Right-wing campaigner and former English Defence League (EDL) leader Tommy Robinson is relaunching himself as an independent journalist – and he’s got off to a rocky start. In just one weekend, Robinson was involved in two brawls: one in Rome, and another in London. Footage of the first incident emerged on Friday evening on Robinson’s own website. He claims he was forced to defend his camera crew against an attempted attack by a man he said was a migrant in Italy. The incident at Central Station was recorded as the right-wing advocate covered the Italian elections for his new website. “I tried to start digging deeper into Italy’s spate of high-profile migrant attacks,” he said. Social media users and Robinson said the man was a migrant, but this has not been confirmed. The video, being promoted through his website, shows Robinson in an altercation with the man, who is protesting against the far-right campaigner being allowed in the area near Rome’s Central Station. 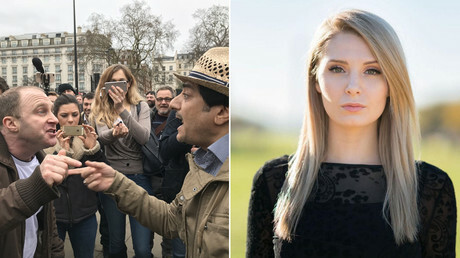 “I’ll get him,” the man can be heard saying about Robinson’s cameraman, to which Robinson replies, “I’ll put you to sleep.” The man then approaches Robinson from behind as he shouts, before the ex-EDL chief spins and hits him in the face. Footage shows a female camera operator, Lucy Brown, on the ground with a male on top of her as she attempts to fight him off. Robinson’s crew said their equipment, microphones and cameras had been broken. He later Tweeted: "I’ve done more scrapping as a journalist than I did doing football." He also criticized police, who he said made no effort to find the group. The alleged assault on Sunday comes a few months after Robinson claimed he acted in self-defense when he was caught on camera throwing punches at a man at Royal Ascot.